NETWORK FINALS: The 8PM rerun of THE BIG BANG THEORY and MAN WITH A PLAN gained 0.1 in final numbers. CABLE HIGHLIGHTS: TNT’s NBA PLAYOFFS game was dominant at 3.51. On VH1, LOVE & HIP-HOP rose 0.07 to 1.04, followed by the season premiere of BASKETBALL WIVES at 0.91. 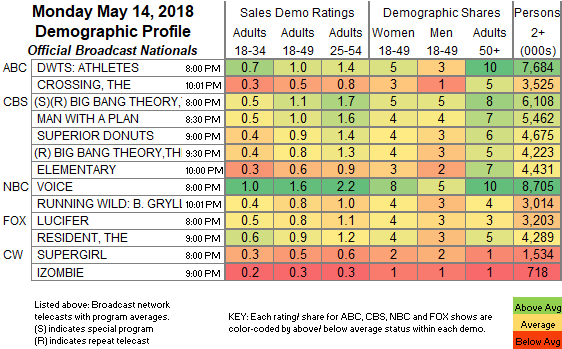 USA’s WWE telecast was at 0.95/0.87/0.87 compared to last week’s 0.91/0.90/0.88, and NINJA VS NINJA was up 0.03 to 0.27. On MTV, TEEN MOM lost 0.07 to 0.65, and YOUNG & PREGNANT was steady at 0.45, with the AFTER-SHOW down 0.04 to 0.29. On Bravo, VANDERPUMP RULES dropped 0.05 to 0.62. NBC Sports Net’s NHL PLAYOFFS game was at 0.44. 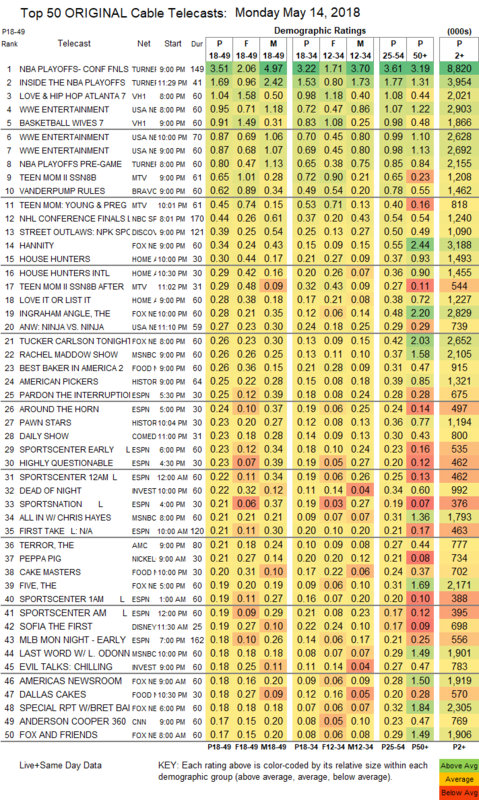 On Discovery, STREET OUTLAWS returned at 0.39. Fox News’s HANNITY led cable news at 0.34/0.55/3.2M, with MSNBC’s RACHEL MADDOW SHOW at 0.26/0.37/2.1M, and CNN’s ANDERSON COOPER 360 at 0.17/0.23/800K. On HGTV, HOUSE HUNTERS slipped 0.02 to 0.30, and HOUSE HUNTERS INTL was up a tick to 0.29, with LOVE IT OR LIST IT up 0.02 to 0.28. Food Network’s BEST BAKER IN AMERICA gained 0.03 to 0.26, CAKE MASTERS remained at 0.20, and DALLAS CAKES ticked down to 0.18. History’s AMERICAN PICKERS shed 0.02 to 0.25, and PAWN STARS held at 0.23. On ID, DEAD OF NIGHT dipped 0.04 to 0.22, and EVIL TALKS was down 0.04 to 0.18. On AMC, THE TERROR was steady at 0.21, and STORY OF SCIENCE FICTION ticked down to 0.08. On TLC, LONG LOST FAMILY was at 0.15, and THIS IS LIFE was at 0.10.